If you're wondering what's with the weird pose, I'm pointing at my pink eyeshadow. If you read my blog, you'll know that I normally do neutrals but that day I wasn't in my neutrals mood and decided to go pink. I'm using the pink and orange from LA Colours Tease palette, Elf All Over Colour Stick (Pink Lemonade) and ZA lipstick on my lips. It looks nuder because I used the new Stage lip liner beneath it. Brows are Empro & mascara's Maybelline. Right.. Self admiring aside.. We had nasi lemak! I don't post about just any nasi lemak okay? This is from 6 To 10 Grill & Nasi Lemak somewhere in Section 17. 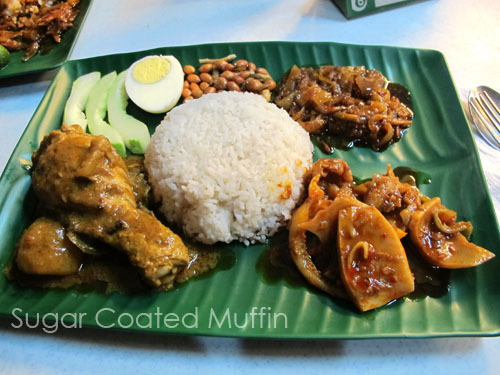 You can choose from chicken curry, beef rendang, sotong sambal, minced meat sambal & some others I can't remember. It's delish! ^_^ Price was a bit high though. I choose chicken curry and sotong sambal so it's RM 11.50. Bf took 3 types and paid RM 15. Next is Khuntai restaurant. Parking was horrible, road's sandy (don't wear heels) and there's no air cond. However, food was served really really amazingly fast O_O I think all our dishes arrived in 5 minutes! The place is quite busy as I see the waiters running back and forth. 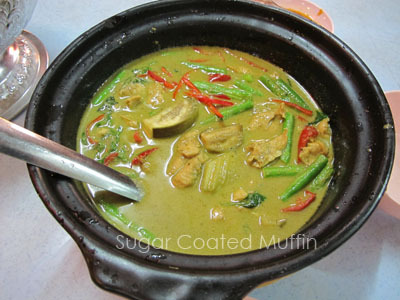 Thai green curry chicken, RM 15. Not the best but still okay. I prefer the Thai curry at My Elephant, Sec 17. 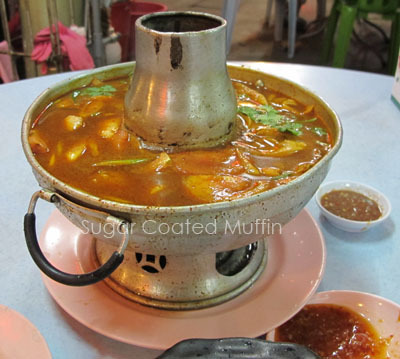 Tom Yum Soup with Fish, RM 19 for small, RM 33 for big. There was a looot of fish in here. It's very nice and not too spicy. Soup was a bit murky for my taste though. 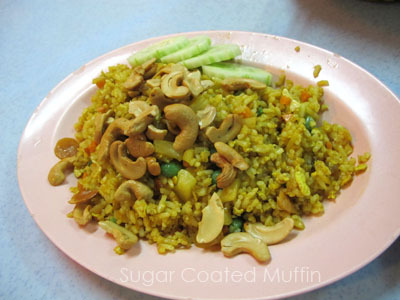 Fried rice with cashew nuts. Not too impressed. 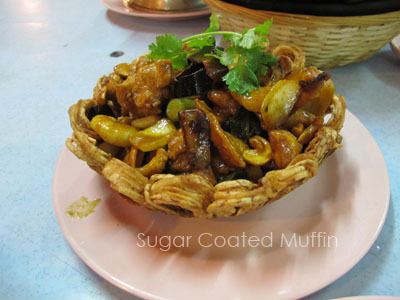 Stir fried diced chicken in yam ring basket, RM 18. Note : This is not the Chinese yam basket. The yam is not soft! I think it was mashed up then piped out to form the shape. The yam was too hard to eat. There was chicken and prawns inside but IMO, quite little. Bill came up to RM 60.80 for the two of us. Overall, I don't really like this place. My Elephant was definitely better (and they serve brown rice!). Oh and er.. Random McDonalds pic xD Can you guess which one's mine? Congratz on your first part time job! Hahaha... Envious, envious but I just got a job too and darn, gotta travel to Sri Hartamas on daily basis already. LOLX! Let's work hard together.